My family has been looking forward to Spring Break to kick back and relax at home together. Our typical schedule has us always on the run! Within our easy plans is a Family Movie Night, for the full family, including our furry, four-legged son, Rex. Never one to miss out on family fun, this Mom loves to find special ways to keep him included. For this family event, my efforts will be in the vein of finding a way to serve him a special treat, as he has no shyness in claiming his favorite spot on the couch for movie time, right in the middle! In selecting a movie for the whole family, especially with Rex in mind, the new release, We Bought A Zoo seems a perfect fit. 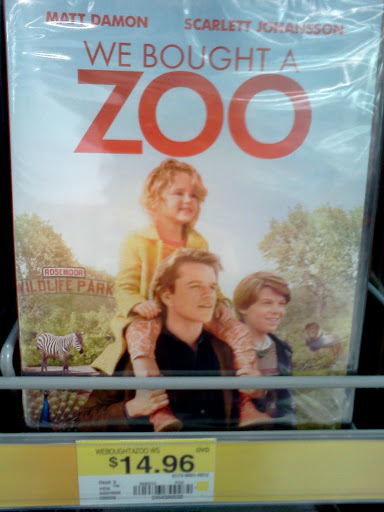 Catering to our family's love of animals, with adult, teen and younger characters, as well as a full array of animals in the mix, it seems a perfect fit to entertain my family. Despite our respite from our usual frenzy, keeping my kids healthy and well-fueled is a regular concern of this Mom. For our special movie treat, we've decided to create a family favorite, Fruit Pizza! With both a sugar cookie "crust" and a variety of flavorful fruit toppings, creating our individual Fruit Pizza masterpieces is almost as much fun as eating them! To prepare for our family event, I stopped off at our local Walmart to pick up the necessary supplies. Stopping off first in the pet treats section, I was thrilled to find that our store is now stocking the larger sized bags of Rex's new favorite treat - Milo's Kitchen. 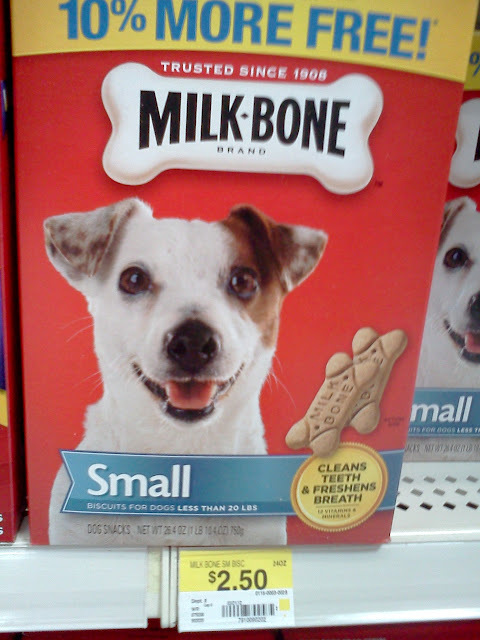 Fresh, thick and gourmet, these treats cause a tail-wagging frenzy like no other treat we've offered him. 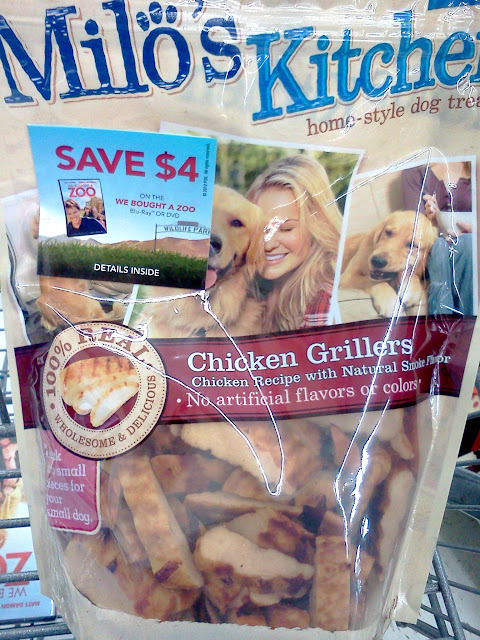 A large bag of Milo's Chicken Grillers offers a surprise bonus - a $4.00 coupon off the purchase of the We Bought A Zoo movie when shoppers buy two participating pet treats, dog or cat food! Score big savings for this Mom! I'm pleased to see that, as well as my choice of Chicken Grillers, a favorite treat staple, Milk-Bone® biscuits are also included in the offer. To create our Fruit Pizzas, I need to pick up a few ingredients, such as refrigerated sugar cookie dough, powdered sugar, as well as a selection of fruits to provide my family with all the options they need to create a tasteful masterpiece. A combination of fresh fruits, like blueberries, strawberries and kiwi fruit, along with the kids' favorite Del Monte fruit cups, peaches and pears, will be perfect for our needs. To accommodate the full family, we'll be creating our traditional Fruit Pizzas, as well as putting a canine appropriate spin on the recipe to provide Rex with a tasty Chicken Grillers and apple treat all his own! You can find the easy recipe ~ Gourmet Chicken Grillers & Apple Treats for Dogs. Wow! Rex is one spoiled little dog to get his own chicken grillers. :) Of course, I can't say anything. Rio had to be given his own plate of lasagna. Sheesh your dog is spoiled!